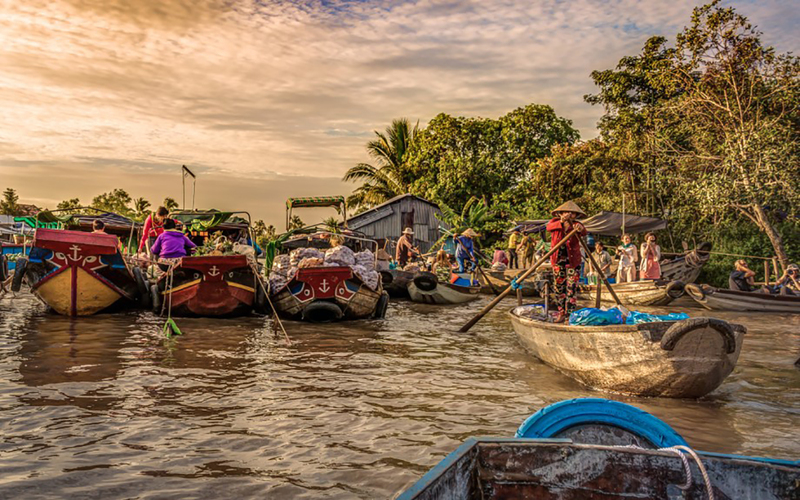 2 days 1 night private trip to MEKONG DELTA is a good package for customers who want to make the trip not too long but still have a chance to get closer with natural. The tour will be a combination of the must do activities and take part into local culture. You will spend time to cycle around the small village, eating the authentic foods and stay overnight at the homestay/ hotel. During the tours, you will have the chance to enjoy the nature of the Mekong, some wild animals if having a luck and a stop at the Chocolate Farm/ Vinh Trang pagoda. This tour is packed full of fun with a lot to see, do and experience ! 7:45 : Welcome by our tour guide at the hotel and heading to MY THO, TIEN GIANG. Heading to visit a famous islands in MEKONG DELTA to take part in the orchards and local homes. Boarding the motorboat and heading to learn coconut candies making process from a workshop. Sample of candies can be tasted. Passing through bee-keeping farm and enjoying honey tea, a typical Mekong house can be viewed along the way. Having lunch with five authentic Vietnamese dishes and fruit for desert. Travel by XE LOI or horse carrying to reach a performance site where Vietnamese traditional music (Intangible Cultural Asset of Humanity accredited by UNESCO in 2013) can be heard and seasonal tropical fruit can be tasted. 13:30 : After exploring the island heading to CAN THO city. On the way, stop at Chocolate Farm where you can see the working process and having the conversation with one of the family member to share about the business stories and experiences. 16:30 : Check in either the homestay/ hotel. Duck hotspot - duck meet cook with tofu cheese, eating with vegetables and taro. Nem Nướng - grilled pork sausage with a lot of vegetables. Cơm tấm - broken rice with bbq rib pork. Bánh xèo - Vietnamese savory pancake. Bánh tráng nướng - Vietnamese pizza. Xôi - sticky rice and smoothie for dessert. Eggplant in clay pot, frog, rat, challenging food (Optional and please request in advance). 20:30: Back to the hotel and enjoy yourself. 5:15 : Starting early for visiting CAI RANG floating market, the highlight of every visit. We will travel by private boat, on the way, driving through the small canals to bring you closer look about the local living style. Then, stop to visit noodle making place, fruit gardens. Having traditional Vietnamese coffee and Hu Tieu - pork noodle soup local as breakfast on the boat. 12:00 : Back to the hotel and check out. 12:30 : Having lunch at the local restaurant. 17:30 : Arriving SAIGON, drop off at the hotel and finish the tour. 1 night at at a 3 stars hotel or equally homestay.